❄【LED AND CABLE LENGTH】Bright 4W(4*1W LEDS), the colors for the slides are updated, so it will not fade away easily.Cable Length is 5M(16.40FT),you can use a waterproof socket with extension wire to make it longer.Since the power adapter is waterproof,so the waterproof socket doesn't need to have the waterproof lid,because sometime the lid may not fit the power adapter properly. ❄【PATTERNS AND WORKING DISTANCE,COVERYING AREA】This Christmas Projector patterns are automatically moving,which can be shown on walls or celings. 16pcs colorful and changeable Slides.The perfect working distance is 5-7 Meters,(16.40FT to 22.97FT In dark places),It can cover 9-15 square meters. The patterns maybe blur if it is in further distance . 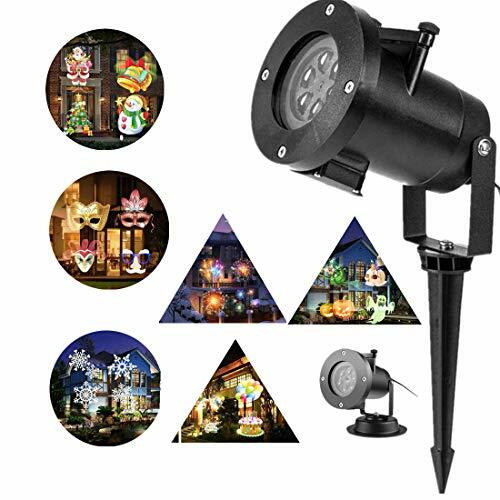 ❄【APPLIED AND WARRANTY】Suitable for Christmas Decoration, New Year, Halloween, Valentine's Day, Wedding, Holiday, Celebration, Festival, Mall, Shop, Bar, Garden, Yard, Club, KTV, Birthday, Family Party and other places. 60 days full money back or replacement for any reasons,please contact us the first time you have any questions or problems,we will anser you within 24 hours.